After an exciting three games on Sunday that saw the Los Angeles Kings and San Jose Sharks trade off first place in the Pacific Division just hours apart, the NHL is primed to respond on Monday with an action-packed, four-game schedule. Things get under way at 7 p.m. 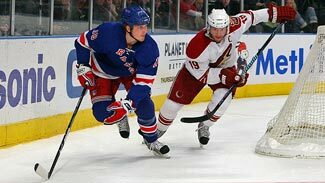 ET, when the New York Rangers look to end a three-game skid as they host the Phoenix Coyotes at Madison Square Garden. The Blueshirts have hit a bump in the road following their seven-game winning streak, as they blew a pair of two-goal leads in Montreal on Saturday night in a 5-4 overtime loss. The Rangers have allowed 16 goals during their losing streak. Phoenix, meanwhile, is off to a 6-3-0 start behind new coach Dave Tippett. The Coyotes will be looking to bounce back from Saturday's 5-3 loss to the Los Angeles Kings at Jobing.com Arena. At 7:30 p.m., the Montreal Canadiens will host the New York Islanders for the second time in less than a week at the Bell Centre. Montreal (5-5-0) trounced the Isles (1-4-4) in a 5-1 victory on Thursday night behind a goal and an assist from newcomer Marc-Andre Bergeron. Monday's game can be seen on RDS in Canada. The Chicago Blackhawks return to the ice at 8 p.m., when they'll host the Minnesota Wild at the United Center. Chicago currently sits atop the Central Division at 6-3-1, while the Wild (3-7-0) are looking to improve from a shaky start to the season. All seven of Minnesota's losses have come on the road. Versus has this showdown in the U.S., while TSN2 will carry the broadcast in Canada. In the final game of the night, the winless Toronto Maple Leafs (0-7-1) will look for that elusive victory in Anaheim against the Ducks at 10 p.m. Anaheim is off to a 3-5-1 start and has lost three in a row -- all on home ice.